The 2014 Red Bull Air Race (RBAR) season gets its official start this weekend in Abu Dhabi. For the first time ever, all of the pilots will be flying with a standardized propeller system — the Hartzell 3 blade composite propeller known as “The Claw.” Hartzell is proud to support all of the competitors with our state-of-the-art composite props. We are particularly excited, however, to be sponsoring Michael Goulian in this year’s races. 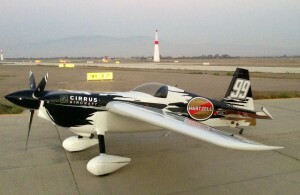 His plane, pictured below, is an Edge 540 carrying the Hartzell logo and the unyielding support that represents. Throughout his career, Michael has relied on Hartzell propellers to support his daring displays of aerial excellence. His dedication to perfection, including a win at the 2009 RBAR in Budapest, Hungary, have been an inspiration to aspiring pilots around the world. The video below shows his dramatic win in front of a record 650,000 person crowd. Michael is one of two Americans flying in this year’s air race season. He will have to navigate a challenging course above the golden sands and blue isles of Abu Dhabi while traveling upwards of 370kph. Hartzell is supporting Michael because he has repeatedly demonstrated nerves of steel, a great attitude and a commitment to fair play and a dogged determination to push the limits of aviation. We’ll have a full report on the results from Abu Dhabi on Monday morning. Check back. UPDATE: Qualifying times have been released from Abu Dhabi. Click here to view them.